NASA engineers have revived a vital science instrument aboard the Cassini spacecraft in orbit around Saturn, bringing the 15-year-old probe back to full strength for the first time in nine months. On Friday (March 16), engineers reactivated Cassini's plasma spectrometer, one of 12 instruments used by the spacecraft to study Saturn and its many moons, NASA officials said this week. It is designed to measure the energy and electrical charge of particles around Saturn. The spectrometer suffered an apparent short circuit last year and was switched off in June to avoid further damage while mission managers studied the glitch. "The investigation led to the conclusion that tin plating on electronics components had grown "whiskers,'" NASA officials explained in a mission update Monday (March 19). "The whiskers were very small, less than the diameter of a human hair, but they were big enough to contact another conducting surface and carry electrical current." Scientists still don't fully understand why the so-called metal whiskers develop on tin and other metal materials on spacecraft, as well as on machines on Earth. But the whiskers inside the Cassini electronics should not post a problem. "It is believed that these or additional tin whiskers that may grow on Cassini cannot carry enough current to cause problems, but will burn out on their own like a lightweight fuse," explained NASA officials with the Jet Propulsion Laboratory in Pasadena, Calif., which oversees the Cassini mission. 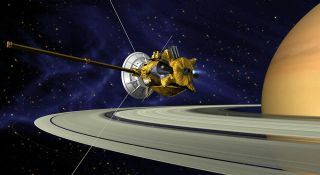 Cassini's odd metal whisker problem began on May 1, 2011, when engineers first detected surprising voltage changes in the spacecraft's equipment. The voltage readings hinted that a short circuit was in process. When the glitch occurred again on June 11, mission managers opted to shut down the plasma spectrometer until it could be explained. With the spectrometer back online, it is once more available for Cassini mission scientists hoping to better understand the environment around Saturn, its rings and moons. NASA launched the Cassini mission in 1997, with the spacecraft arriving at Saturn in 2004. The probe also carried a European-built lander called Huygens that landed on Saturn's biggest moon Titan in 2005. Cassini's originally mission ended in 2008, but the flight has been extended two times, most recently until 2017. The mission is a joint effort by NASA, the European Space Agency and the Italian Space Agency.